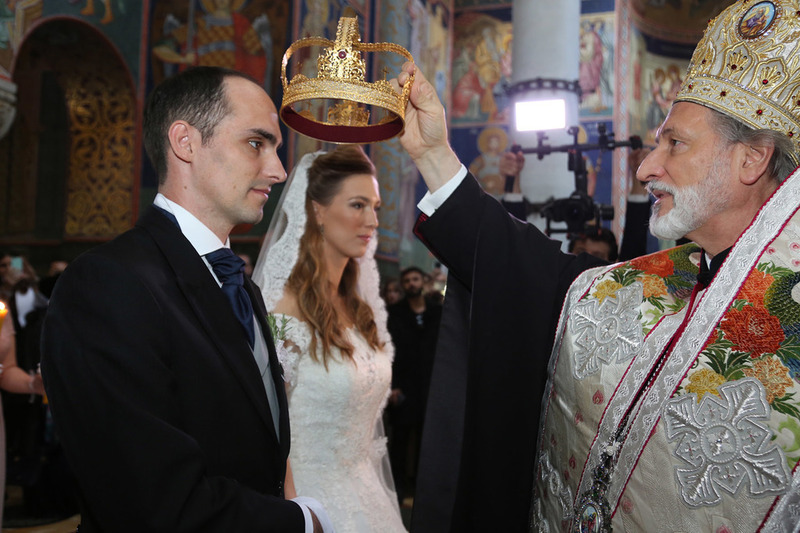 His Royal Highness Prince Mihailo Karadjordjevic and Miss Ljubica Ljubisavljevic were united in holy matrimony in the Church of Saint George in Oplenac, which was followed by a reception given by Their Royal Highnesses Crown Prince Alexander and Crown Princess Katherine, for invited guests at the White Palace. The religious ceremony was officiated by Their Graces Bishop Irinej of the Eastern Diocese of the Serbian Orthodox Church in America and Bishop Pahomije of Vranje and Father Petar Lukic, Dean of Saborna crkva in Belgrade. The wedding of Prince Mihailo Karadjordjevic, the youngest son of the late HRH Prince Tomislav and HRH Princess Linda, and Ljubica Ljubisavljevic, was attended by over 300 guests – members and friends of the Royal Family Karadjordjevic, as well as by numerous distinguished guests from public life in Serbia and abroad. The wedding was attended by Their Royal Highnesses Crown Prince Alexander and Crown Princess Katherine with their children Prince Philip and Alison, Princess Linda Karadjordjevic (mother of Prince Mihajlo), Prince Djordje Karadjordjevic (brother of the bridegroom), Princess Fallon Rayman (wife of Djordje Karadjordjevic), Princess Elizabeth Karadjordjevic, Speaker of the National Parliament Maja Gojkovic, Minister of Education of Serbia, Science and Technological Development Mladen Sarcevic, ambassadors of Great Britain, Brazil, Congo, Mexico, Myanmar, Canada, Pakistan, Norway, Turkey, Argentina, India, Azerbaijan, and many others. Following the wedding at the reception at the White Palace, Crown Prince Alexander wished the newlyweds the bride and bridegroom a long and happy life together. “It is my duty and privilege to welcome Her Royal Highness Princess Ljubica in our home, and to greet the bride’s and groom’s parents, wishing and hoping that good fortune, health, and family blessings follow the new couple and be in our homes, through them and in them”, Crown Prince Alexander said in his speech. The newlyweds respected Serbian wedding customs, but they were also innovative, so beside the Serbian traditional music, guests had the opportunity to enjoy a cello concert by two young ladies, the winners of a National Contest. The food was based on Serbian tradition. Companies which donated the food are Hyatt, Metropol, Nuzy Bakery, Nada Butcher Shop, Pekara 30, wine was from the Royal Winery Oplenac and Aleksandrovic winery, cake and sweets were a gift by Anci Kolaci Company from Pancevo, and the company “Bean and Leaf” took care of the coffee and tea.